On Tuesday, we celebrated poet Pablo Neruda with our post about the movie Il Postino. Neruda was a great fan of poet, Julia de Burgos. We love the Julia de Burgos portrait on this new stamp from the U.S. Postal Service. De Burgos was one of Puerto Rico's most esteemed poets. Neruda stated that her calling was to be the greatest poet of the Americas. Here is a translation of her poem El mar y tu. 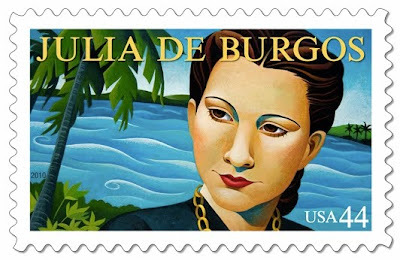 The Julia de Burgos stamp is the 26th stamp in the USPS Literary Art Series. is no less blue, an eternal birth. you both go breaking the ports and the oars. in a simple duel of mystery! so that they give, united, their beams. and the passion dress in sailboats. and leave me in the water of two skies.